Hundreds of cyclists were arrested on Friday night after trying to take part in a Critical Mass event. Critical Mass takes place every month and has been going for eighteen years however on this occasion police clamped down heavily to prevent the cyclists from taking the intended route and the evening ended in serious violence and mass arrest. In the first few seconds of this video British Transport Police Officer 4125 is shown grappling with a man in a Shopmobility scooter, and then aiming something at him. (Probably CS spray.) The man shouts several times “I am disabled” but is ignored. A police medic can be seen trying to wrestle him away and prevent him from using it. Further in at 1:06 he can be seen and heard striking someone with a baton. 27th July 2012 19:30pm In the early stages of the Monthly Critical mass Bike ride a British Transport Police Officer PepperSprayed a Disabled Man in a shoprider who had been apparently hit by a car along with several others. During the melee as the officer is pulling out the pepper spray , A fellow Female police medic attempts to stop the action, but is struck back and the officer sprays the Disabled man and most of us in the crowd, not satisfied, he then whips out his telescopic truncheon and trys to apply a wrist lock / neck Lock on the Disabled man using the truncheon. Eventually a real Police officer arrives with 3 vans and about 50 Backups. The disabled man is arrested and the British Transport Cop is led away by some other officers. 27th July 2012. Here is the event shown in the video above from a different angle. Guardian: Critical Mass police ban blocked by law lords – 2008 article. Critical Mass ruled lawful and attempts by the police to ban it were overturned. Scientists from Rothamsted Research recorded this video in an effort to open dialogue with the protesters. There is no market for GM wheat anywhere in the world. This isn’t true. Plenty of GM products are sold and consumed, although some of that is through abusive behaviour by large US businesses. That is a different problem to address. Perhaps they mean that people are generally opposed to GM food, but whether true or not that should not stop experiments that could have far-reaching benefits. People should be allowed to make their own choice. I fully support the idea that any product sold which contains GM ingredients should be labelled to allow people to choose. farmers around the world at minimum cost. I wonder how this organisation can support this statement. I do not believe that GM crops increase world hunger, but I do know that large companies are abusing patents to force the purchase of GM seeds in many cases. This is a problem with those companies and not with GM products. Take the Flour Back’ will be a nice day out in the country, with picnics, music from Seize the Day and vandalism and destruction of scientific experiments before the evidence can be gathered by people who fear what they do not understand. The trial is happening in the open air, meaning that when it starts to flower it can cross contaminate other wheat crops and wild grasses. This is a real threat. The GM plots will be separated from the edge of the trial by 10 meters of barley (or space) plus a 3 metre ‘pollen barrier’ of wheat that helps to contain pollen from the GM plants within the trial site. All these plants are treated as though they are GM and harvested /destroyed at the end of the trial. There will be no cereals grown for 20 metres outside the boundary of the site and no wild relatives of wheat that can cross with our cultivated variety exist in the vicinity. Couch grass species, distant relatives of wheat will be controlled in a 20 metre wide area around the trial site to avoid any slight possibility of cross-pollination. I am completely in favour of a right to free speech and the right to protest, even with people that I do not agree with. However, I am horrified at the idea of destroying scientific research. To make good policy we need knowledge, we need evidence. We obtain evidence through research. To destroy this research before we have any results is like setting fire to a library. Risk assessments have been carried out, precautions have been taken, consultations were carried out. Even if those who object did not engage at that time surely if there were a danger then they could attempt to stop things now through legal processes which will make a decision based on evidence. I think the protesters have probably not done so because the evidence is not on their side. This was followed up with a news story on the Green Party website which repeated some of the false statements made by Take The Flour Back and announced that Jenny Jones would attend the protest. I believe this represents support from the Green Party for vandalism and the destruction of scientific experiments. One of the reasons that I took a long time to join the Green Party after betrayal by the Liberal Democrats in 2010 was the anti-science attitude that I saw with their policies supporting homeopathy and reacting against many things out of fear and contrary to evidence. Indeed, the Green Party knew that this was a problem and recently made an effort to make their policies evidence based. I joined about three months ago when I thought that things had changed but this fiasco over GM experiments has left me feeling that I cannot trust the party. Perhaps I have given the Greens less of a chance than I did the LibDems but after one betrayal I am not waiting around for another. I no longer feel that I can trust political parties. Manifesto pledges mean nothing. Promises seem to lead to the exact opposite behaviour. Politicians happily lie and mislead the public as to their true intentions. I’ve learnt my lesson. I sent in my resignation to the Green Party a few minutes ago and I will no longer support any political party. There is a campaign by Sense About Science and a you can sign the petition asking people not to destroy research. He said protesters targeting the Games will be “letting down” Britain. Does this sound a little bit… familiar? Fear of informants among family, friends and neighbours is a characteristic of most totalitarian regimes. When the state is so authoritarian that everyone is guilty of some crime or another, everyone must fear being reported by everyone else, perhaps in return for some government favour or some hope of immunity. I note that Mr Robertson implies that any dissent, any protest should be reported, not just illegal behaviour. Before we go any further, it’s worth looking at what happened at the last big event. Prior to the royal wedding last year the police arrested people pre-emptively, people who only wished to protest in a perfectly legitimate way. Some of them merely had signs expressing their objection to the public spectacle. I suggest you read my blog post on this, The suppression of dissent. Protesters have often been intimidated by police in the past, and it has been happening a lot recently too. A protest in November last year was heavily intimidated in the days before with talk of rubber bullets and water cannon, and with letters sent to warn people away. In the end it wasn’t as bad as that, but the police effectively silenced the protest and kept it out of sight. Protesters have routinely been kettled, including “hyper-kettling” and beaten with batons. Alfie Meadows was injured so badly by a police baton that he needed emergency brain surgery, yet he was charged with violent disorder instead of the police officer that did that to him. The Met deny responsibility even when innocent bystanders are unlawfully killed (murdered) such as in the case of Ian Tomlinson. Kettling has recently been found legal, although hyper-kettling was not considered in that judgement. We have seen armed police at protests recently. Austerity is causing massive dissent. NHS cuts, service cuts and closures, welfare cuts have all been controversial and provoked protest. Despite all this, most protests go unreported by the press unless there is violence. I would expect peaceful protest around the Olympic games; something of that expense and magnitude and with so much corruption will of course be a focus of unhappiness from those who see what is happening. I think that it is highly likely that we will see pre-emptive arrests before the Olympic games, and in all likelihood it will be worse than those at the royal wedding. I seriously doubt that the police will care whether or not a planned protest was going to be peaceful and obedient or was going to break the law. In fact the last government already made arrangements to make even peaceful protest, a vital right, illegal around the Olympics. It is the security operation around the games themselves that worry me though. The Met police have been acquiring new toys recently. Water cannon are still a possibility, but these CBRN barriers will certainly be used. Even with all the security equipment the government are obviously scared of dissent. During the games there will be 13,500 troops deployed as security staff, in addition to an unknown number of police officers. MI5 has recalled 3,500 agents and cancelled holidays around the games. HMS Ocean will be moored on the Thames estuary with Royal Marines on board, and HMS Bulwark will be present for events around Weymouth. There will be Surface to Air Missiles around London ready to bring down any threatening aircraft. There will be an SAS unit nearby. So that these can all be deployed quickly to quash any naughtiness, 290 CCTV cameras have been moved from Birmingham to London. Just what is and isn’t allowed has also been tightened up. 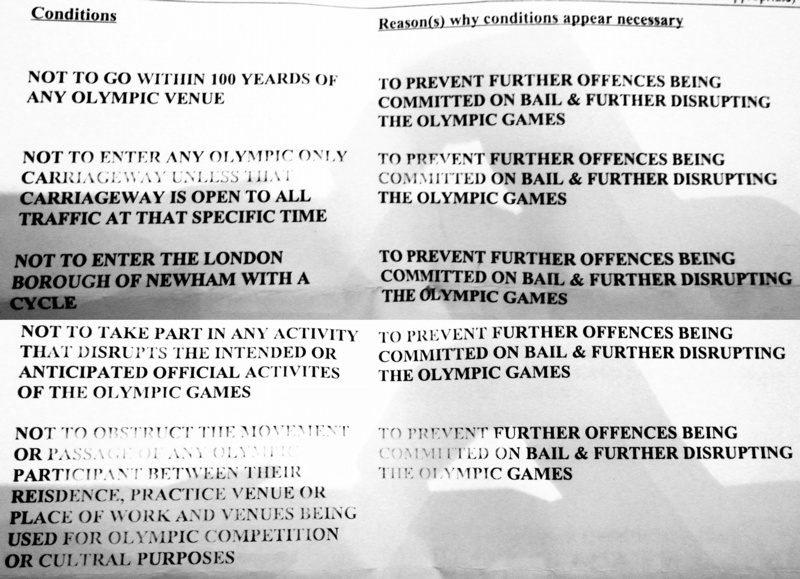 The last government introduced a law to make all the changes for the games. The no marketing right protocol says that businesses are forbidden to associate activity with the Olympic Games. No Olympic Rings can be used in any signs or displays, the phrase “London 2012” is protected and enforced, and you can’t use “2012” either because the enforcement got a bit over-zealous. First we have the case of Cafe Olympic, a fairly generic name and innocuous enough, you would have thought. The name had to be changed. A butcher in Weymouth had to remove display of Olympic rings and the number 2012 made from sausages. In a slightly bizarre move it seems that border control at our airports and ports have access to information on people involved in the Olympics – even torch bearers. When Bryony Gordon was stopped on entry to the UK she was questioned on what she was doing at the Olympics – who knows why – because the person checking her could see that she is going to be a torch bearer. All of this security clampdown is really just the last straw. I have already written about how the Olympics are full of corruption, taken over by corporate involvement, hugely expensive (Possibly as much as £24 billion in reality) and has many more problems. See my previous blog post, Olympic Opulence: Bread and circuses without the bread. Even the BBC published an article with 10 reasons some people will dread the Olympics which I recommend that you read. I wouldn’t object to an Olympic games that focussed on the sport and the athletes. These Olympic games, though, are an expensive, corrupt, authoritarian farce. Are you sure that they are worth the price? My report from the Invisible Invincible protest is now on The Pod Delusion podcast. Unfortunately it had to be cut by quite a lot to fit the available space, but you can read my original text below. It is largely based on a previous blog post with some added explanation. My report starts at 15:17 in to the podcast. An MP3 file is available for download via The Pod Delusion website. This is the email that I have just sent to my MP ahead of the Welfare Reform Bill activity in parliament this week. I am writing to you once again about the welfare reform bill, which as I am sure you know will return to the commons on Wednesday. I have received your previous letter dated 11th January 2012 and I am sorry to say I feel that your response was inadequate. In that letter you assured me that the the changes to DLA are the result of one of the biggest consultation ever carried out by the Department of Work and Pensions; however I must inform you that the report which I sent to you and asked you to read proved without a doubt that the government had not only ignored the results of that consultation, but had completely lied about the results in order to claim support where there was none. You may be aware of a protest that took place at Oxford Circus in London this Saturday just passed. I was one of the people involved in that protest and as a result I have been interviewed by LBC, The Guardian, The Times, The Sunday Times, and many more. I was interviewed live as the top story on BBC London Radio news. I can safely say that there is a lot of interest in our objections to this bill and that the people affected do NOT trust either Iain Duncan Smith or your government. If you care to look I have included links to many of the news stories on my own blog, a link to which is at the end of this email. I have many objections to the Welfare Reform Bill. By the government’s own admission, the change to PIP will remove support from a great many people. The cumulative effects of this change, and other proposed changes, will be to leave people dependent on more expensive and more acute services. In the end this will cost the government far more than is saved, and will lead to people moving out of communities and back into care homes and institutions. There are a great many other things wrong with the Bill but what is even more concerning is that way that the government has lied – and I use that strong word quite deliberately – and misled the public to promote their position. They have ridden on the back of scrounger rhetoric from the tabloids, rhetoric which Anne Begg of the Work and Pensions select committee said was being fueled by careless press releases from the DWP. I would go further and suggest that the DWP and the ministers involved are deliberately providing incomplete and out-of-context information to provoke these headlines such as “75% are faking” and other similar attacks. In short, I do not trust the government, I believe the welfare reform bill to be an irresponsible, mean, penny-pinching and harmful piece of legislation that was drafted without thought or care for the evidence of its impact. I urge you to pause this legislation and review its impact, or at the very least, do not overturn some of the meagre efforts that the Lords have made to mitigate some of its worse effects.